Birch trees have the most beautiful bark.You can create a mini forrest with Birches by doing the classic Edna Walling method of throwing a bunch of potatoes and planting a Birch wherever your spuds land. What a view. Only problem is, nothing grows under an established Birch. 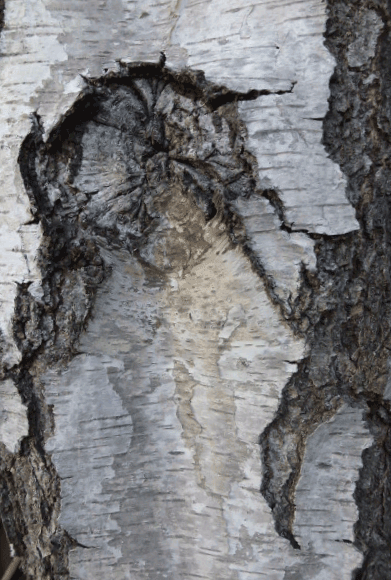 Case 1 – I once had a client and friend in Ascot Vale, she had some lovely established birches, but would always curse them. I thought we could persevere but my friend was right. So instead we planted Azaleas in nice big pots on a pebble mulch. This filled in the space quite nicely. It was a front garden which could only be seen from inside the house, the trees and the elevated Azaleas worked a treat. Case 2 – I planted a garden in Northcote about 3 years ago. It had an established Birch tree in the front garden. I decided we could use native Lomandra grasses and Correas to fill out underneath. Well, 3 years later I have conceded defeat. Correas are an excellent Australian native, the ideal plant for dry shade. And, Lomandras, well these are what I call car park plants. Tough evergreen grasses. The birch won the day, so rather than work against it, we worked with it. I reshaped the garden beds to mirror the curve of the front deck, and added blue metal to compliment the bluestone ballast that is already a feature of the garden. This covers the main drip line of the tree, and further out from there we have a mix of Correas with other dry shade plants. Case 3 – my place. In my new found home many moons ago, and as a devotee of Edna Walling, I planted 3 birches. Perfect tree for height in a small space. Now, I have 2 lovely fastigate birches (that’s a very narrow form), and, one Betula pendula under which nothing, and I mean nothing will grow. So my solution is to create a raised round garden bed with steel edging to reflect the rest of the gardens shape. It will be clear of the tree, like an oversized pot almost, then I can fill it with lots of colour to contrast with that lovely white trunk.